A decent nights rest for all!, which is a great way to start the day. But still the biggest stumbling block right now is food. Luke is just not feeling it, doesnt really want anything but ice cream or other sweets and where Luke goes, Lily follows. It has been a connumdrum for me and one I am tryin ghard to figure out. Yesterday we had a stand off over a bowl of turkey stew, which is just not a good place to go to. So I am trying to have a very open and very forgiving and very patient attidue, but the whole thing kind of confounds me. 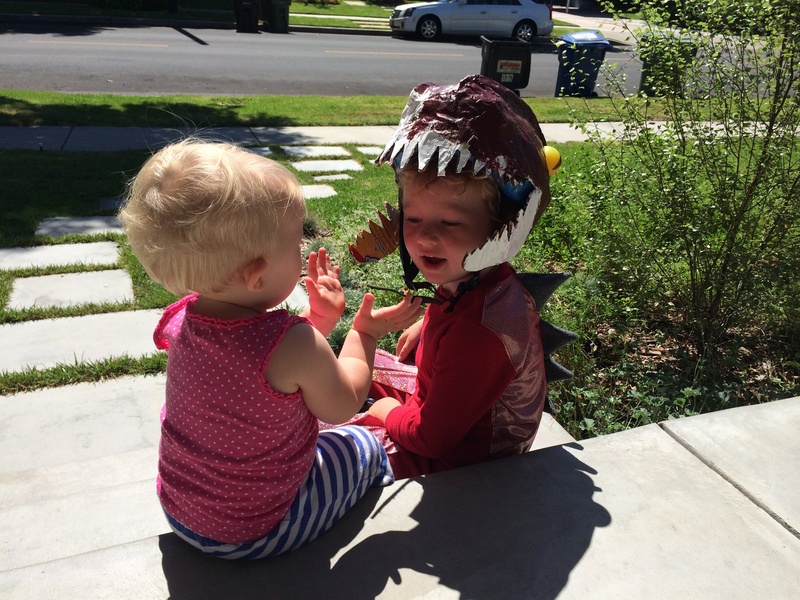 But, Luke appeared in his T. Rex outfit that we made and he painted from last halloween, and that is alwasy a great fun. I kinda had to be home all day to meet people in regards to the forthcoming kitchen remodel, boy is that going to be a cluster. And what could be better than a vanilla ice cream sandwich after dinner, not much. Then Luke told me he was looking for dinosaur dicks. I was taken aback, but didnt say anything, he ran out to the yard, got his shovel and started feverishly digging all over the place, stopped, pulled his pants down to go pee (single handed), went back to digging, he came back and asked for more tools. I asked “What exactly are you looking for?”, to which he replied “Dinosaur dicks!”, I said, “what is that second word?”.